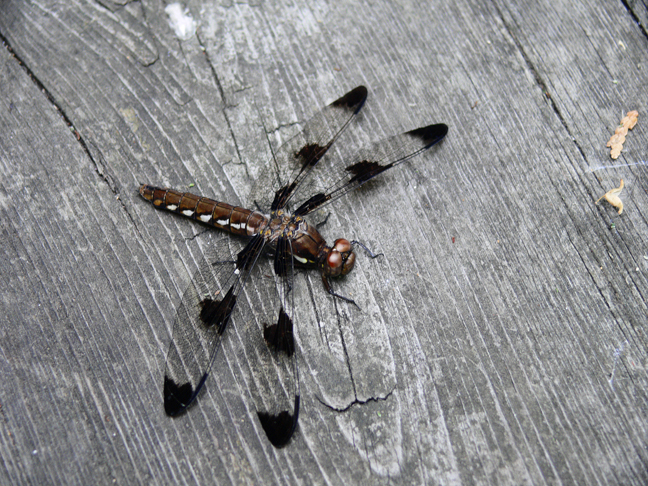 Sometimes called "horse stingers" or "mule killers", the adult dragonfly is actually one of the good guys who feed on more harmful insects such as mosquitoes, catching and eating them in flight by forming its 6-legs into a basket that entraps. Its fascinating delicate double wings can propel it forward at nearly 60mph as well as allow it to hover in place and fly backwards. The wings do not move in tandem but in opposite directions, the forward pair stroking upward while the rear pair strokes downward. Extinct varieties had wingspreads up to 2.5ft (76cm). Flying adults live only briefly, a few weeks to a few months. But as aquatic nymphs breathing through gills they will have foraged for from one to five years, molting their outer skins up to 12 times before finally leaving the water and taking to the air. Mating often takes place while flying, the fertilized eggs may then be deposited within stems of water plants. Young nymphs hatch within one to three weeks. The large compound eyes of the adult can see motionless objects up to 6ft away, moving objects up to 18ft away. Credit World Book Encyclopedia for many of the above details. But what is not discussed therein is the brain of the dragonfly. Tiny in comparison with ours, yet it manages flight and ambulation, metabolic functions, and processes all the information coming from multifaceted compound eyes and the chemical and thermal sensors on antennae and appendages. AI, artificial intelligence, researchers have developed autonomous flying machines for the military, but nothing approaching the compact capabilities of this humble insect. That we have not yet been able to artificially duplicate something approaching the complexity of the dragonfly has been taken by some detractors of the theory of evolution as evidence of that theory's inadequacy. But to the contrary, all systems making up the overall complexity of the dragonfly are in themselves made up of simpler naturally occurring processes, many of which we admittedly do not yet fully understand. That these many simpler processes can, have, and continue to amalgamate into things more complex such as dragonflies provides ample evidence that nature is rule governed and moving in a direction most of us have yet to fully appreciate.